The Royal Canadian Mint has expanded its extremely popular $20 for $20 series with the release of the $20 for $20 Hockey Fine Silver Coin. A design found on the reverse of the strike is emblematic of Canada's national pastime, the sport of hockey. This coin marks the seventh to be offered by the Royal Canadian Mint in the $20 for $20 program. Like other coins of the series, the $20 face value strike may be purchased for $20. The series has proved popular with collectors. All previous issues achieved a sell-out status within weeks, if not days, of their release. 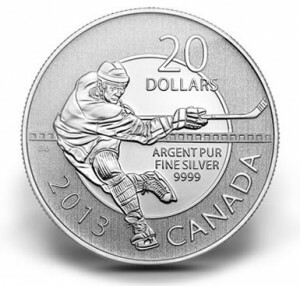 This newest Hockey Silver Coin is likely to follow the same pattern. As of this posting, the Royal Canadian Mint indicates the Hockey Coin is already at the 86% sold threshold. Maximum mintage for the release is listed at 250,000. This is the same mintage as seen in previous $20 for $20 releases. The design found on the reverse of the coin was completed by Greg Banning. It shows a hockey player in action on the ice. Surrounding the design are the inscriptions of 20 DOLLARS, 2013, CANADA and ARGENT PUR FINE SILVER 9999. Found on the obverse of the coin is Susanna Blunt's effigy of Queen Elizabeth II. Obverse inscriptions include ELIZABETH II and D G REGINA. Those interested in obtaining the $20 for $20 Hockey Silver Coin may do so directly from the Royal Canadian Mint, while supplies last. Orders are accepted on the website of www.mint.ca or by calling the Customer Solution Center at 1-800-267-1871 (Canada), 1-800-268-6468 (US) or (613) 954-2626 (International). A household order limit of 3 is in place.